Project for the promotion of renewable energy for local development in Bissora, Oio. 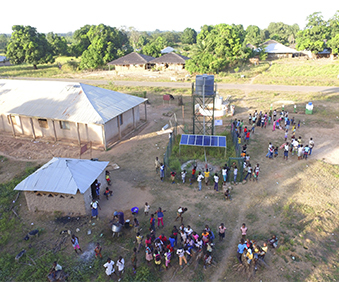 This intervention is part of the EU-ACP Energy Facility Programme, which aimed to improve access to affordable and sustainable energy services for rural and peri-urban populations, in this case, in the Oio region of Guinea Bissau. The project ran from 2012 to 2016 and achieved several important challenges such as the establishment of 36 solar-powered water pumps, and constructing 7 production centres to increase access to processing machines for local crops in the community. Furthermore, solar-power systems were installed for light and small appliances in 51 community facilities, including schools, mosques, health centres and community centres. 2,600 householdes in the Bissora sector benefited from these improvements and preliminary feedback from communities suggests impacts such as a decrease in womenâ€™s workload and increases in agricultural production as well as farmersâ€™ income.